Many have the desire to incorporate their T-Rex 700 into a body. The quality of the fuselage mouldings at Vario have a very good reputation. The selection of fuselage models for non-Vario mechanics like the T-Rex has been increasing each year. 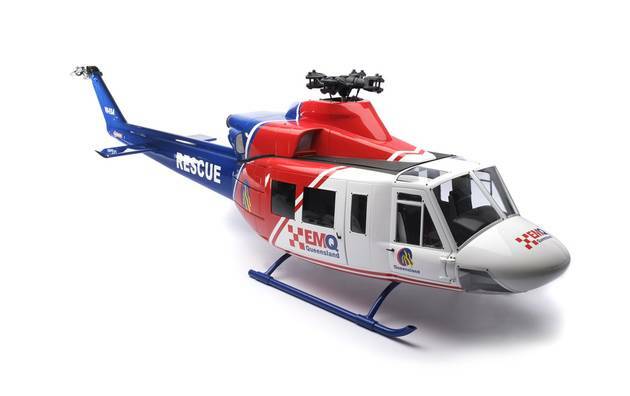 The kit comes complete, to supplement an existing T-Rex 700 mechanics (Version 2011, DFC and DFC-Dominator) to a Bell 412. The fuselage sections are made of white, unpainted fiberglass allowing the builder to finish in their desired paint scheme. Cockpit and scale options are sold separately. Without remote control components.